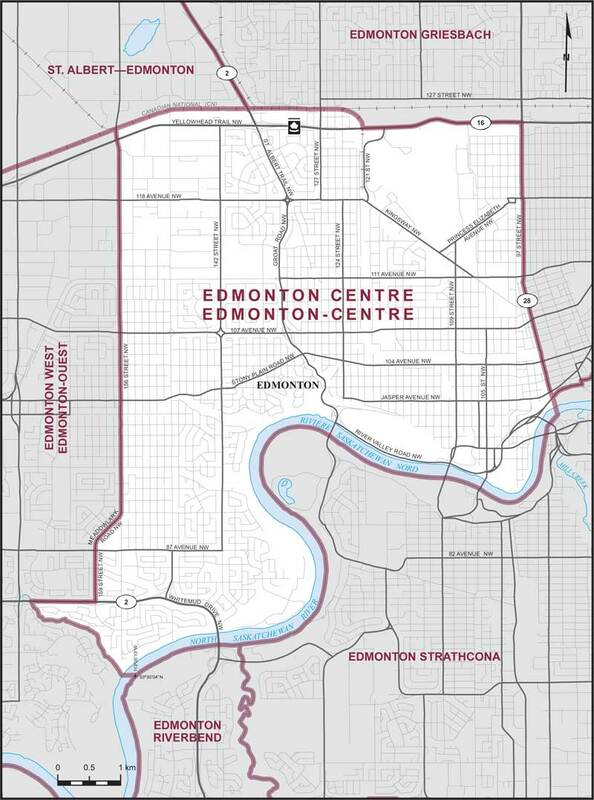 Consisting of that part of the City of Edmonton described as follows: commencing at the intersection of Yellowhead Trail NW (Highway No. 16) with 97 Street NW (Highway No. 28); thence southerly along said street and its southerly production to the right bank of the North Saskatchewan River; thence generally southwesterly along said bank to a point due east of the mouth of an unnamed creek at approximate latitude 53°30'04"N and longitude 113°35'13"W on the left bank of said river; thence due west in a straight line to the mouth of said creek; thence generally northwesterly along said creek to Whitemud Drive NW; thence easterly along said drive to 159 Street NW; thence generally northerly along said street, Meadowlark Road NW and 156 Street NW to the Canadian National Railway; thence generally easterly along said railway to Yellowhead Trail NW (Highway No. 16, west of 121 Street NW); thence easterly along said trail to the point of commencement.